It’s hard not to look twice at those million dollar displays with flashing lights, loud music and all the frenzy of a Vegas headliner show. But when a serious, qualified lead is looking for information regarding a company’s service or product—she will be more impressed, feel more invited and ultimately engaged in a booth with clear branding that she identifies with. Equally as important is an attentive and knowledgeable booth staff that understands her needs. To get the most out of your display budget — start by planning. You will need clear branding that provides a snapshot of what your product is and what differentiates it from the competition. Branding, booth design and promotional giveaways that show you know your target market. Avoid unnecessary production costs and rush shipping charges. Invest in good basic display items that you can build on. Make use of display accessories for seasonal promotions and changes in audience demographics. At your next Pop-Up Shop or Trunk Show, turn up your visibility with the power of custom-printed, dye-sublimation fabric graphics. Reasonably priced, under $500 with graphics included, DisplayStar carries a wide variety of table top Wave Tubes, banner stands and table throws. Effective and versatile, banner stands are the new display essential. 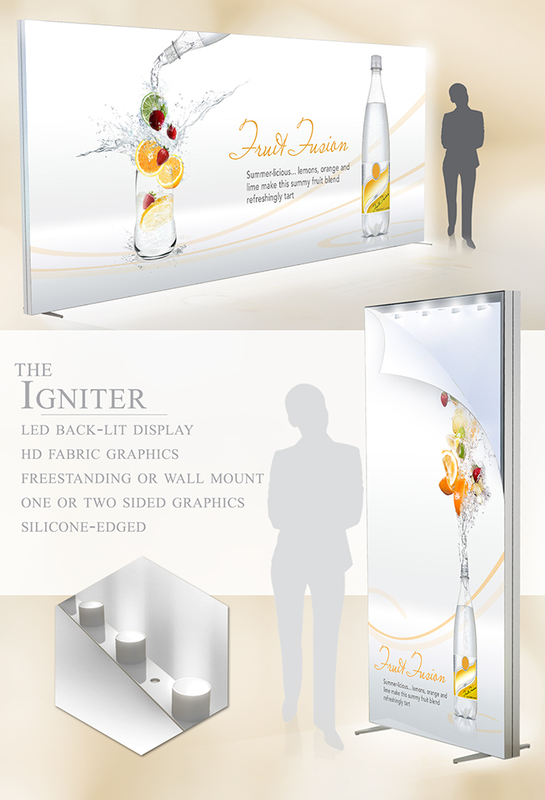 Banner stands work great as a single unit, or grouped to form a dramatic back wall. Add them to an existing display to announce a new product or sales promotion. Under $500, shown from left to right: Excel Banner System Square Tower, Economy Retractable Banner Stands, and Stretch Fabric Banner Stands. DisplayStar’s travel kits “Pack a Punch & Pack up Small.” With every piece fitting neatly into a case, DisplayStar provides the essential booth basics for the trade show circuit—with savings at about 10 percent! Ranging in price from $600 to $800, with custom fabric graphics included, the kits offer a choice of a table top Wave Tube or classic backdrop, with table throw and/or table runner. Do not clutter your booth; a few key pieces will speak plenty. Start with a basic foundation such as a Star Fabric or a Standalone Tension Frame. Shown left, 10 Ft. Curved Star Fabric; right, Standalone Tension Fabric Frame, 8 Ft. x 7 Ft. Dye-sublimation graphics are included in price. Table top displays, table throws and countertops are perfect accessories for transitioning your daytime display into a nighttime event—and you need a place to serve cocktails and hors d’oeuvres. The Curved Pop-Up (far right) is available in a black, lightweight Velcro-receptive surface—perfect for adhering touchable lingerie samples. DisplayStar’s Igniter Light Boxes are a perfect choice for extraordinary, long-distance visibility. Dye-sublimation printed fabric graphics combined with LED back lighting create deep density colors and blacks that brighten for stunning memorable impact. Custom sizes available. Built with strong, lightweight aluminum tube frames, Wave Tubes are exceptionally portable. Perfect for trade show road warriors. Your custom, dye-sublimation, pillowcase graphic simply slips over the frame and zips at the bottom. Shown top to bottom: 20 Ft. Curve Wave Tube Kit with Medium Case and 20 Ft. Straight Wave Tube with Medium Case. Graphics are included in the price. DisplayStar’s 20 Ft. Timberline Hybrid displays are an ideal display for shows such as CURVE that showcases lingerie and swimwear. Modular designs, with dye-sublimation fabric graphics, make the Timberline easy to customize with light boxes, monitor mounts, shelves and clothing racks. Graphics must quickly explain a company’s product or service. The good news is that advancements in technology have made graphics even more affordable and powerful with high resolution dye-sublimation fabric printing. However, with such stunning visual impact available, the challenge is to clearly and quickly provide a snapshot of what your product is and what differentiates it from the competition. When working closely with the launch of a new company, product or service, the new exhibitor might overlook explaining what they think is obvious. Exciting graphics don’t mean anything if they don’t explain what differentiates your product. In addition, it is also wise if your trade show graphics carry over branding from your website to make your booth even more familiar. With graphics at about 50 percent of the cost of your display, it really pays to think your branding through and even test it on a focus group (which could even be a small group of your customers). It is also worthwhile to consider hiring a graphic designer. The cost could easily outweigh the price paid for lackluster and unclear graphics. If your product is unique because it is made from 100 percent natural fibers, it is not enough to simply show a model in the product. Although a model can be part of the display, you need to say “our products are 100% natural fibers.” This is not the time for high-art, nuance or mystery. Do not leave your show-goers guessing. Like your branding, your booth should reflect a deep understanding of your customer. Do your customers like soft and frilly or intense and techno. Make them comfortable and identify with your space so they will want to stay and mingle. Your promotional giveaway does not need to be expensive, but it does need to show that you know your customer. For example, intimate lingerie buyers would be impressed with fragrant sachets, candles and incense. Keychains and plastic tumblers say nothing about your ability to understand what someone might be looking for in intimate lingerie. Save a fortune by avoiding rush production and shipping charges. Allow plenty of time for making changes to your artwork, proofing it for typos and submitting it to specifications. Problems such as these can be resolved, but they take time and that can mean extra charges for expedited production or shipping. Check your display in advance for product defects. Before the show, when you receive your display, it is important that you do a test assembly. Although products are thoroughly inspected beforehand, they can be damaged in shipping. DisplayStar’s hardware is under warranty and we are happy to replace it at no charge. However, expedited shipping will add costs. Furthermore, the organizers of the show may charge for late set-up. Do not clutter your booth; a few key pieces will speak plenty. An overly busy booth with too many pieces is not only hard to move around in, but also creates a lot of visual noise. The ambiance is not relaxing and inviting. 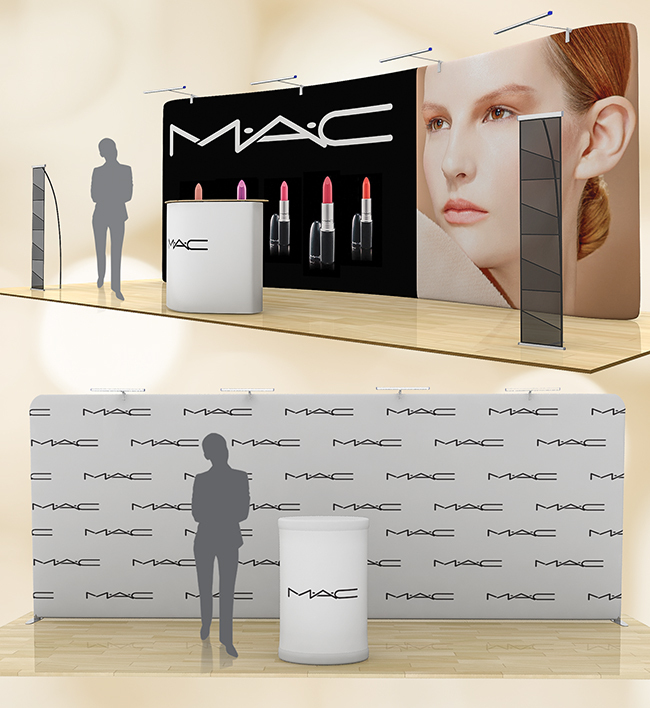 Start your booth with a few key display items with clear branding such as a graphic back drop or modular display—with a counter or hanging banner. Think of these pieces as investment, foundation pieces—like purchasing a classic, tailored, year-round suit to build your wardrobe around. DisplayStar offers a variety of quality displays with superior durability, affordability and portability. These displays are perfect building blocks for the new trade-show goer and will last for years. In the $1,000 – $1,500 category are displays 10 feet and under such as the Star Fabric Pop-Up Display, Wave Tubes (displays with a pillow case graphic) and traditional Pop-Ups. All come with dye-sublimation graphics and are lightweight, portable and easy to assemble. Starting at slightly more than $1,500 is your basic 10 foot Timberline Hybrid. The Timberline is perhaps the best foundation piece because it is great by itself, but additional 10 foot modulars can easily be added and arranged in numerous inline and island configurations. There is no limit to the number of configurations. The Timberline units provide flexibility for changing trade show objectives. One 10 foot increment can maintain classic, timeless branding such as the La Perla lingerie logo while adjoining units can display new La Perla holiday or swimwear lines. Your company may want to display trends in new fabrics, plus sizes, menswear and fantasy-specific lines. Integrating components make the Timberline easy to customize with light boxes, monitors, shelves, slat walls and waterfall racks. This versatility makes the Timberline ideal for targeting specific trade show goals such as introducing or showcasing different products. Reception desks, cases and counters are ideal for demonstrating new products. Customize your display with inexpensive accessories. Think of display accessories like a brightly-colored Hermès tie or scarf. When added to your classic, dark grey suit—your look becomes something completely different. Reasonably priced, under $500, dye-sub, custom-printed accessories such as banner stands, table throw covers, counters and even director chairs can completely update or redirect a display’s objective. Banner stands added to a display are particular effective in announcing sales promotions such as fragrance or romantic weekend getaways to be given away with lingerie purchases. Very portable, retractable banners can also address a specific demographic at different shows or locations such as plus sizes or GLBT audiences. Custom printed table throws help transform your booth space into an event space for a fashion show or exclusive designer visit. Save about 10 percent with a display kit. Pre-selected display kits save about 10 percent and provide a good starting point for someone who might not know their trade show needs. DisplayStar’s most popular kits are Wave Tubes and Star Fabrics with accessories such as countertops, literature stands and table throws. The cost of custom printed graphics is included in the kit price.